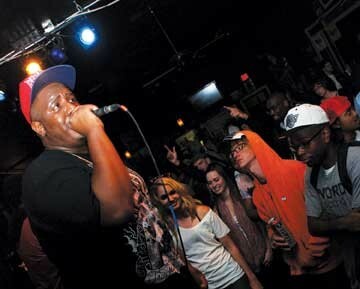 Local rapper melds old and new, North and South. Memphis rapper Timothy Love — aka Royal'T, aka Lvkah Lvciano — was something of an anomaly when he made his first steps onto the local hip-hop/rap scene. "I liked Playa Fly and Project Pat," Love says, citing established rappers from his native South Memphis, "but I also had an uncle from Chicago who introduced me to old-school cats like [New York artists] Kool G Rap and Nas." Love, a precociously polished rapper still a couple of months shy of 21, also grew up around the underground Memphis hip-hop scene of the early aughts, with Iron Mic Coalition rapper/producer Ennis "Fathom 9" Newman dating Love's aunt. Adding to Love's unusual perspective was his background as a home-schooler: "In school, everybody listens to the same thing. At home, I could venture out into my own world," says Love, who, this week, will release Dreamz x Schemez x Green, his fourth album-length release in less than two years. Love, who has gone by Royal'T but is releasing his new album under the Lvkah Lvciano moniker, is yet another aspiring Memphis rapper, but one whose honeyed flow blends North and South, rough and smooth. "They would look at me weird," Love says of how friends would react to his diverse tastes and his nascent rap style. "They would ask, 'What are you listening too?' But what it did for me was give me a better way of putting things. It expanded my vocabulary. I don't want to say they're smarter, but in New York hip-hop, they use different slang." Love first tried to make his way in the local scene with a short-lived teen group called Mic Runnaz. "Three friends rapping, just having fun. Finding ourselves," he remembers. But as Love's personal style developed, the group fell apart. "I started to venture out more, and people in the group didn't see eye to eye. They said I sounded too Northern," says Love, who remains close to rapper/producer A Quest, one of his Mic Runnaz colleagues. Love emerged as a solo artist in late 2010 with Raw Gospel Muzik, which connected him to the city's earlier underground hip-hop scene via copious guest appearances from scene vets such as Fathom 9 and Jason Da Hater. At the time, Love didn't know other young Memphis rappers in his vein, but falling into a cohort of like-minded young MCs soon after — such as Knowledge Nick, Preauxx, and breakout scene star Cities Aviv — helped Love develop his style. "I like the way Cities carries himself. He's a free spirit," Love says. "Preauxx was so much more hype on stage than I was. And Nick had a better delivery than me at the time. They made me start thinking about what I could do to make myself better." Cities Aviv and Preauxx made appearances on Love's next collection, last summer's I.D.K. (FUMZ), which tapped into electronic music and rock for a sound and tone that evoked the then recently erupting, Los Angeles-based Odd Future collective. "When I was in Mic Runnaz, I made dark music, before I knew Cities Aviv or Odd Future," Love says. "I always had a dark side. But [seeing] Odd Future [have success] made me feel safe doing that." Though he doesn't have a traditional Memphis rap sound, Love comes from a more traditional Memphis rap background than the punk-schooled Cities Aviv or the New Orleans transplant Preauxx, and that's partly — maybe increasingly — reflected in his music. Love calls last fall's 4 All Seasonz his "battle-rap MC" album: "I wanted to show people I could rap real good. That album was about me battling with the mic, in a cocky and comfortable way." But 4 All Seasonz also included a preview of sorts for the new Dreamz x Schemez x Green in the form of a three-song trilogy — "Street Dreams," "A Gangsta Story," and "Hood Tales" — that saw Love putting his verbally deft and morally weighted spin on more traditional Memphis rap content. After so many releases in such quick succession, Love spent 10 months between full-lengths this time. "I wanted to take my time and put it together," he says of an album that features seven of 19 tracks that are self-produced. "I wanted to give people as much of my story as I could. It's a really personal album." The album opens with a song called "Bluff City Mindstate," where Love announces, "I grew up around thug niggas, gangbangers, and hustlers," and spends most of the rest of Dreamz x Schemez x Green musing on what that environment meant to a sensitive observer. "BBH" translates to "broke, bored, and hungry." "Nappyhardheaded" is a coming-of-age story rooted in the explanation "Didn't listen to my mom/Pops didn't tell me nothing." "A lot of people in my family don't know that much about me," Love says. "My father doesn't really know me. He was around, but not a lot. Nothing positive. This [album] is me talking to him. I knew that for people to know more about me, I had to go deeper into a place I didn't want to visit. It's for both people, for my father and my fans." The result is probably Love's most Southern-sounding solo work so far, albeit in the tradition of the more lyrical Southern street-rap pioneers such as Memphis' 8Ball & MJG or early Outkast. And though Love now cites other rappers of his generation that he admires — internet-driven upstarts such as New York's Rocky A$AP, Action Bronson, and Joey Badass, or the Odd Future-connected California cult sensation Earl Sweatshirt — he still looks back to '90s hip-hop for his chief inspiration. "It will forever be the classic stuff," he says. "It moves me in a way I can't even explain." Hi-Tone Café, Saturday, September 1st, 9 p.m.